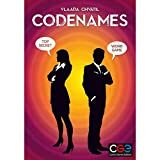 In Codenames Pictures, two rival spymasters know the location of all agents, innocent bystanders and an assassin on a map. Each Spymaster needs to communicate the locations of their own team's Agents to the Field Operatives in their respective teams, so that clandestine meetings can be held! To do this, each Spymaster sends a coded message to their Field Operatives. The Field Operatives must decode the message correctly and find the Agents, or they may be ambushed by an opposition Agent or the Assassin! Split the group of players up into two teams of equal size. One team is designated Red, and the other Blue. 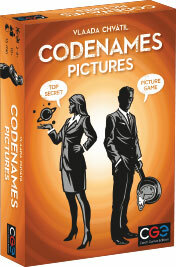 At least 4 players are needed for a game of Codenames: Pictures (also Variant Rules for 2P and 3P). Each team nominates a Spymaster. The Spymaster from each team sits next to each other at the head of the table. The other members of each team sit across from their respective Spymaster. Shuffle the Picture Cards, and place 20 Picture Cards in a 5x4 grid, facing the Field Operatives - this is known as the Map. Each picture represents a location where an Agent might be met. The little arrows should point to the top left corners from the Field Operatives perspective if the pictures are correctly orientated. One of the Spymasters shuffles the Key Deck, and draws one card, which both Spymasters can examine, and place on a stand, (facing only them). The Key Card represents the positions of Agents (red or blue, for each team), the Assassin (black) and Innocent Bystanders (cream) on the map. The lights on the side of the Key Card determine which team starts (red or blue light). The team that goes first will have to guess an extra Agent. The Red and Blue Spymaster each place a pile of 7 Agents in their colour next to themselves. 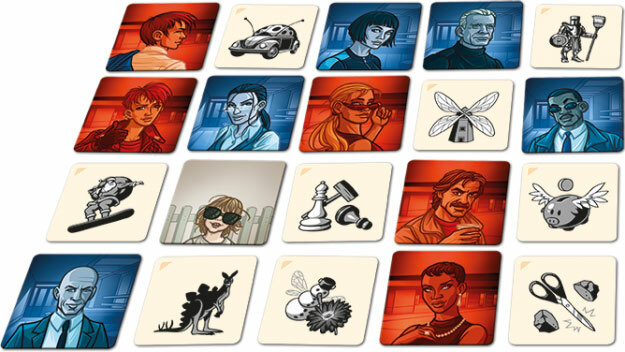 The Spymaster of the team going first takes the Double Agent Tile, which indicates the extra Agent they must guess, flips it to the side in their colour, and adds it to their Agent Stack. The Spymasters place the stack of 4 Innocent Bystanders and the 1 Assassin between themselves. Beginning with the starting team's Spymaster, Spymasters take it in turns to give a one word Clue about the locations of their Agents, to their Field Operatives. The Operatives must guess where the Agents are on the map. Play continues in this way until one team has located all their Agents (or the game ends early if one team touches the Assassin's space and loses). On their turn, the Spymaster gives a single word Clue, followed by a number. The word is the common word that associates a number of location pictures containing his Agents. The number is the number of locations to which the Clue applies. The Spymaster ideally only wants to give Clues for locations that contain his own Agents. Ideally the Spymaster wants to give a Clue that covers as many locations as possible (so his team wins first), but a Clue that is sufficiently differentiating that his team choose the right locations! The Clue must be one word - no multiple words, abbreviations, or compound words. Your group may choose to relax this rule, but they must agree this before playing. Word-play is allowed (i.e. a word with two meanings), but your team may not guess that you mean both! You may spell your Clue word out to clarify where two words with different meanings sound the same. Your Clue must be about the picture on the location, not about where the card is in the grid. Your Clue may not pertain to the letters contained in the name of the picture you are giving a Clue about, or its shade. Singing, funny accents and foreign word Clues are not permitted (unless your group agrees to it). Your group may choose to add further restrictions on describing the pictures if they wish to. Unlimited - You can give your Clue word followed by "unlimited" instead of a number, which gives your team unlimited guesses (following the other rules of guessing), however, your team won't know how many items relate to the new Clue, and how many relate to Clues they missed in previous turns. Zero - You can use 0 as the number in your Clue to denote that none of your Agents relate to the Clue. This functions the same as unlimited in that your team may make as many guesses as they like (assuming they continue to guess correctly). Once the Clue has been given, the Field Operatives of that team discuss between themselves what they think the Clue means, i.e. which locations it applies to. The Spymaster cannot speak or give any facial cues to the team as to whether their discussion is correct. When the team are ready to make an official guess, they touch picture that they think fulfils the Clue. If the team touches a space that holds an Agent of their own team colour, their Spymaster places an Agent tile in the team's colour on the space. The operatives may continue to guess locations based on the original Clue. If the team touches a space that holds an Innocent Bystander, their Spymaster places an Innocent Bystander tile on the space. The team's turn ends. If the team touches a space that holds an Agent of the opposing team's colour, their Spymaster places an Agent tile in the opposing team's colour on the space. The teams turn ends, and they have helped the opposition! If the team touches a space that holds the Assassin, their Spymaster places an Assassin tile on the space. The game immediately ends with that team losing! They make a wrong guess (i.e. an opposing Agent, an Innocent Bystander or the Assassin is revealed). They decide they do not wish to guess any more (i.e. aren't confident they can get any more right). They have made (N + 1) guesses, where N = the number given in the Clue. This catchup mechanism allows the team to 'catch up' by guessing an Agent from a Clue given by their Spymaster earlier in the game. The game ends when one team has found all of its Agents. One team may accidentally make the other team win if they reveal the wrong Agent on their turn. The game may also end when a team reveals the Assassin. Preparation for the next game: Assign a new Spymaster for each team. Flip all picture cards to their opposite side. Draw a new Key Card and you are ready to play! Similarly to the game of Pool, teams try to find all of their Agents, and then to find the Assassin. Play the game as normal, except that after a team has found all its Agents, it must find the Assassin last. If an operative guesses the assassin and his or her team still has pictures that have not been guessed, their turn becomes a "sudden death" finish. The team gets no more clues. They keep guessing, trying to guess all their remaining pictures. Their number of guesses is unlimited, regardless of the number specified by the spymaster's clue. If they successfully guess all their remaining pictures, they win. Any wrong guess (Innocent Bystander or opposition Agent) ends their turn and causes them to lose the game. If there are only two players, or a large group that do not want a confrontational environment. Set up the game as usual, but you only have one Spymaster (all other players are Field Operatives), and you are playing against a "dummy" team. Take a key card that makes the chosen team colour they starting team. Play as normal, avoiding opposition Agents, innocent bystanders and the assassin. The Spymaster simulates the opposing team by adding one of the opposition Agents to the map every time it would be their turn. If the dummy team reveals all its Agents first you lose. If your team reveals the Assassins, you lose. 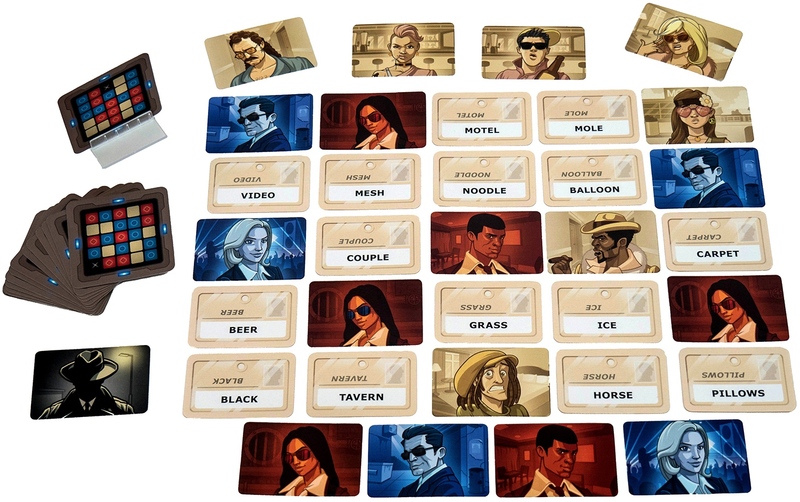 However, if you reveal all your Agents first, you score depending on how many cards are left in the Dummy team's stack (and check your rating in the rulebook!). Players set up as per the normal setup. The only difference is that the remaining player who isn't a Spymaster is a field operative for BOTH Spymasters (and must do a good job for both of them). 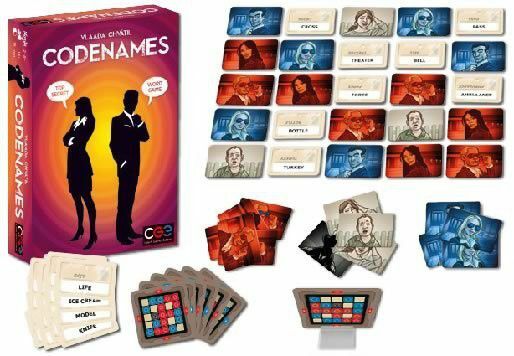 You can mix both Codenames: Pictures and Codenames together if you like, using either a 5x4 grid (use the Agent Cards and Key Cards from Pictures), or a 5x5 grid (use the Agents Cards and Key Cards from Codenames). You can mix both words and pictures together for more fun!